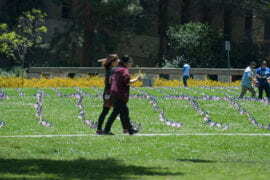 Late on Memorial Day, a small group of UC Irvine student-veterans and supporters gathered in Aldrich Park armed with balls of twine to grid a large patch of lawn. 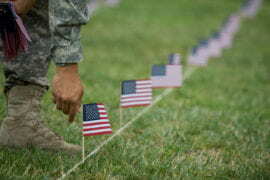 They returned just after sunrise Tuesday with thousands of miniature American flags to plant along the grid, ready to complete their mission: honor fallen service members from the Iraq and Afghanistan wars and raise awareness of the 8,000 suicides committed by U.S. veterans each year. 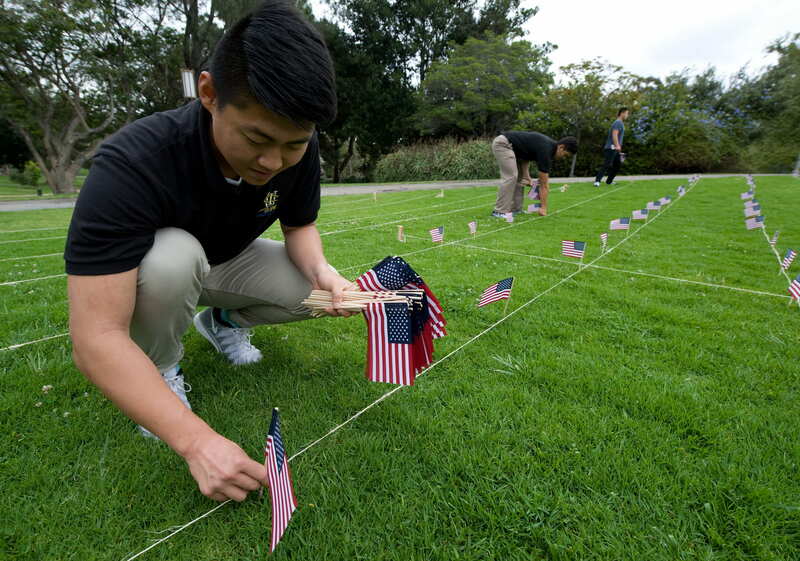 “We wanted to reflect what’s done on the national level here at UCI,” said Michael Flores, president of UCI’s Veterans Professional Fraternity, which organized the event. 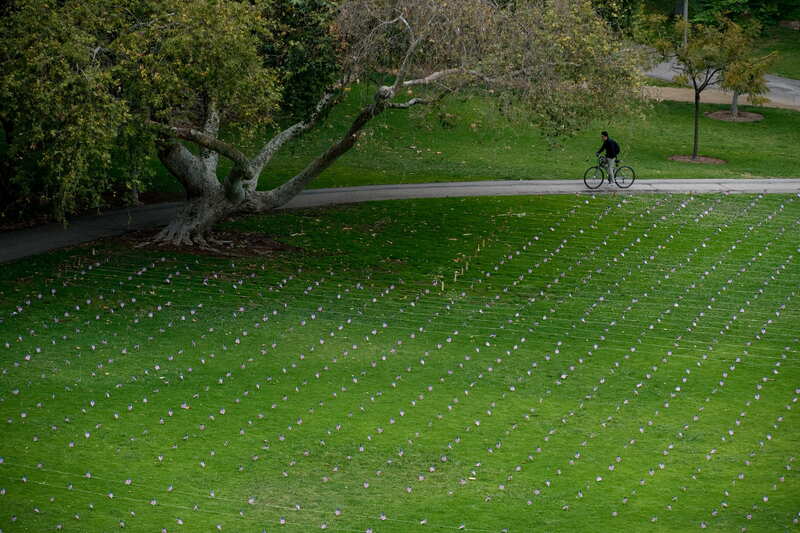 Inspiration for the display – called “The Weight We Carry” – came from the annual Memorial Day flag installation at Arlington National Cemetery, a 60-year tradition that recognizes deceased service members by placing more than 228,000 American flags at their graves. “When we went out into the community and asked if this display would be a good thing, we found support from every corner of the campus,” Flores said. 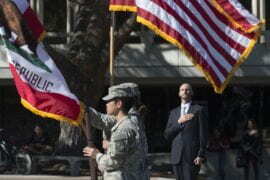 UCI has one of the largest populations of student-veterans in the University of California system, second only to UC San Diego. 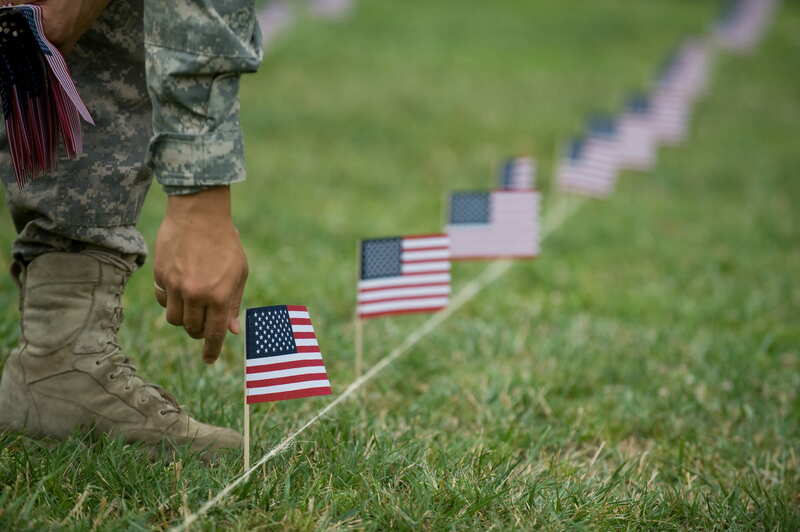 Over the years, administrators have worked to make the campus a friendly place for current and former military personnel by offering resources such as guaranteed housing, priority registration and veteran mentorship. 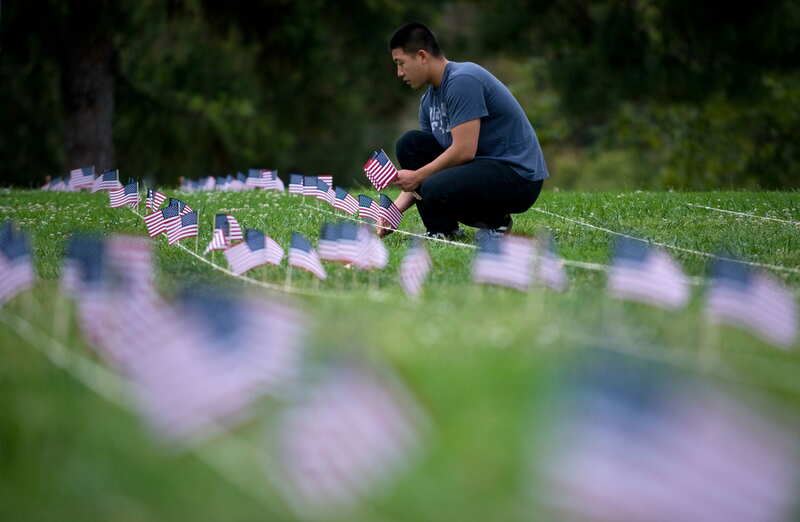 In addition, UCI’s online Master of Advanced Study in criminology, law & society recently was named the best of its kind for veterans and active-duty service members by U.S. News & World Report. 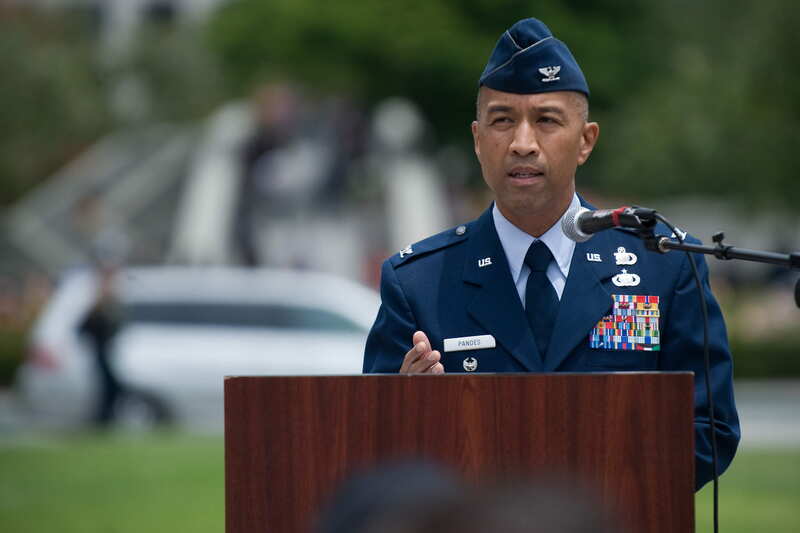 “Even though we’re not in uniform and we’re not usually seen, veterans are still a big part of this campus, and these programs reflect that,” Flores said. To show support for these students, UCI Veteran Services hosted the sixth annual Veteran Appreciation Dinner on May 28, featuring remarks from Chancellor Howard Gillman, Vice Chancellor of Student Affairs Thomas Parham and keynote speaker Frank Orzio, a two-time Purple Heart recipient, Vietnam veteran and founder of the Wounded Warriors Ministry. Along with recognizing veterans for protecting the principles of democracy, Gillman said, it’s important to acknowledge their historical, influential role in changing the demographics of higher education to include people of all socio-economic backgrounds. “The veterans of this country proved that higher education was for everyone,” he said. At the dinner, more than 20 outstanding student-veterans were awarded “Bridging the Gap” Military Scholarships and Thomas T. Tierney Scholarships, the latter funded by the longtime philanthropist, Vietnam veteran and UCI Foundation trustee. This year’s Tierney scholarship recipients are Jason Heckard, computer game science major; Matthew Hoeffner, criminology, law & society major; Varinea Romero, anthropology major; and Suriel Ortega, criminology, law & society major. Ortega, a first-generation college student from Anaheim and an Air Force veteran, also won a “Bridging the Gap” scholarship, awarded to students who have exhausted their GI Bill education benefits. Ortega used up most of his GI Bill academic funds completing general education courses at a community college. 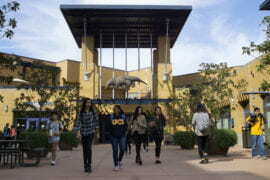 When he was accepted to UCI, he was excited but worried about having the financial means to complete his bachelor’s degree. 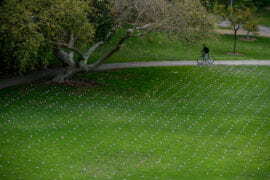 Scholarships have allowed him to focus on his studies and graduate later this year. He currently teaches pre-deployment combat arms at March Air Reserve Base, but his ultimate goal is to practice law.